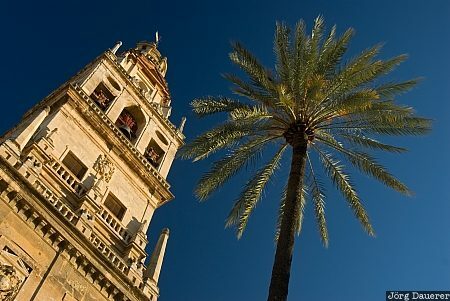 Campanario de la Mezquita, the bell-tower of Mezquita, the church/mosque of Cordoba and a palm tree in front of blue sky. Cordoba is in Andalusia in southern Spain. This photo was taken in the morning of a sunny day in April of 2008. This photo was taken with a digital camera.